The card today is a really simple lazy card and it doesn’t involve any stamps. I needed to make a card with a name on it and didn’t have any stamps big enough so I just created one in Microsoft word and then printed it on some card. The font is Scriptina, love this font. 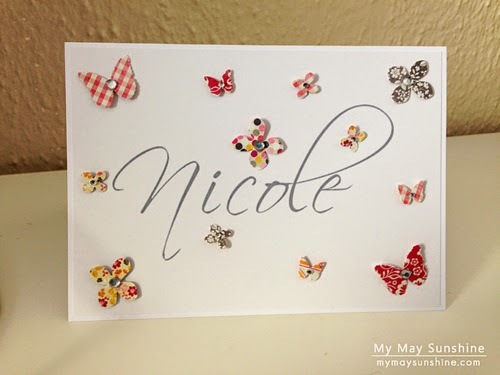 To embellish the card, I punched out some butterflies and flowers from some Martha Stewart punches in different patterned papers, added some little gems to the centre of the flowers and butterflies and I put them on some glue dots to make them more dimensional. 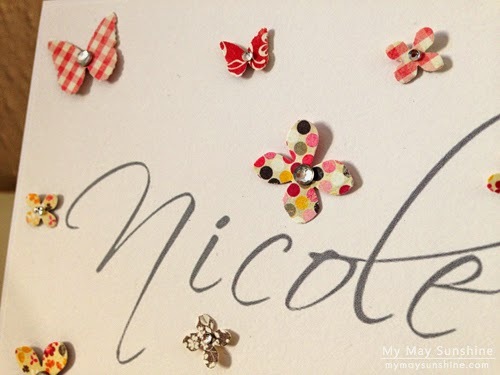 Papers – My Minds Eye The sweetest thing honey | Punches – Martha Stewart 3 in 1 butterfly and 3 in 1 hydrangea | Gems – Hobbycraft. I really liked the way this card turned out with the style of the font and the patterned papers. I have a feeling I may be making more quick cards like this too.